“As an online discussion grows longer, the probability of a comparison involving Nazis or Hitler approaches 1,” states the famous internet saying known as “Godwin’s Law.” The adage means that if any online discussion goes on long enough, someone will eventually mention Hitler or Nazism. The axiom is so popular that it was included as an entry in the third edition of the Oxford English Dictionary in 2012. As it turns out, the colloquial law may be provable with concrete evidence. Analysis of the popular threads on the social news site Reddit show that nearly 80 percent of all posts with more than 1,000 replies contain at least one reference to Hitler or the Nazis, CNN reported on Thursday. A statistician who blogs under the pseudonym “Curious Guru” analyzed a database of 4.6 million publicly available Reddit threads, and found that 78 percent of subreddits with more than a thousand comments have at least one mention of Hitler and/or the Nazi party. With even a mere 101 comments, the chance of a mention of Hitler approaches 15 percent. 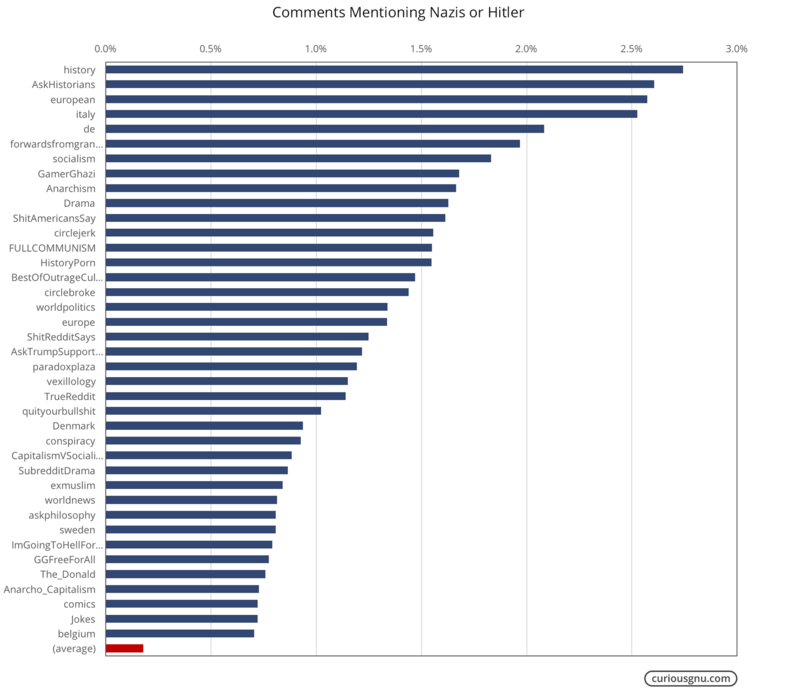 Of course, mentions of Hitler or Nazi Germany on Reddit comment threads are by no means relegated to history discussions or geographical and political subreddits, which contain, by far, the largest number of mentions. In the subreddit called “History,” 2.5 percent of all comments involve Hitler or related topics to Nazi Germany. Other Reddit forums where mentions are popular include “AskHistorians,” “European,” “Italy,” and “De” (short for Deutschland). However, even brushing aside historical forums, Hitler references are quite popular on Reddit. The more replies a thread has, the more likely it is to have a Hitler reference, as CNN noted. Due to obvious time constraints in checking millions of threads on Reddit, the data scientist is sure to mention that the data does not account for the exact context of the references to “Hitler” or “Nazi,” and thus cannot serve as a final or complete vindication of Godwin’s Law, which specifies there will be a comparison made to Hitler or the Nazis. The data only shows that the mentions appear in the first place, which might also be explained away by references to popular World War II movies, etc. If you add another 100 comments on top of 900, the likelihood becomes 70 percent. The all-pervasive references to Hitler and the Nazis are probably not shocking to anyone who has spent a significant amount of time on the internet, where forum discussions frequently go wildly off-topic, turn to politics, and eventually invoke strong passions and delve into the dark subject of Nazi Germany. Still, it is rare to see the common experience backed up by statistical evidence. For some, the study may raise questions as to the types of environment for discussion and communication popular internet forums really provide, as CNN notes. A spokesman for Reddit declined a request from CNN to comment.